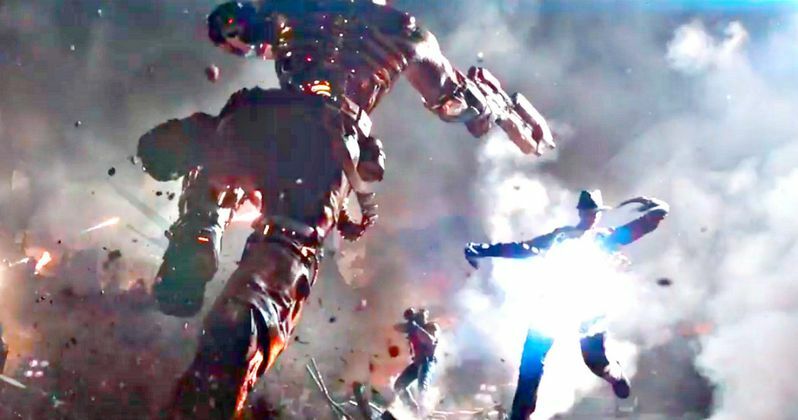 The trailer for Steven Spielberg's Ready Player One is here and it looks like a dystopian dream or nightmare, depending on how you look at it. Warner Bros. bought the movie rights to Ernest Cline's novel Ready Player One in 2010, before the book was published. And fans have wondered ever since when the bestselling novel would hit the big screen. Now it arrives under the direction of Steven Spielberg. The wait is finally over for first footage, as we have our hands on the trailer. And oh, what this footage contains. There are so many Easter eggs your head is going to explode. Freddy Krueger, The DeLorean, Iron Giant, Tron. The list is massive. The near future is finally here and it looks, well kinda crummy. Apparently, the only way to escape is to plug into the OASIS and relive the 80s to forget about your current life. Parzival, aka Wade Watts (Tye Sheridan) is seen wearing his VR visor and haptic gloves inside his hideout, which is an old van. There's apparently a lot of wealth in the world, but not for just anybody. The wealth is for a select few while the majority of the population have nothing and the only way to escape is to plug into the OASIS in an effort to try and beat the pop culture puzzles. If one beats the game they are awarded the OASIS and its parent company, which Wade and his treasure seeking online friends try and do to protect it from the giant IOI corporation. The only way for Wade to protect the OASIS is by uncovering clues with his virtual friends and allies whom he's never met in the real world: Art3mis (Olivia Cooke), Aech (Lena Waithe), and I-R0k (T.J. Miller). While their greatest foe in this quest is Nolan Sorrento (Rogue One's Ben Mendelsohn), who is IOI's villainous chief of Oology. "Oology" is the study of eggs, easter eggs to be specific, aka secrets within the game. Wade and his team are competing against the rest of the world as well to uncover as many easter eggs as possible. Mark Rylance, who plays James Donovan Halliday, the creator of the OASIS in Ready Player One recently told Vanity Fair that the movie will be "very faithful" to the book while also being its "own story." In other words, there's going to be quite a bit of changes to Ernest Cline's book, but that's to be expected when a book as expansive as Ready Player One is translated into a movie. T.J. Miller's character i-R0k will have more of a prominent role in the movie than he had in the book and Ben Mendelsohn has said that his character Nolan Sorrento will be quite different than the book. Well, here it is. Our first look at Steven Spielberg's Ready Player One, straight from San Diego Comic-Con and it looks fantastic and chock full of the pop culture of the 1980s that you'd expect. The movie hits theaters on March 30th, 2018, but until then you can maybe go read the book for the first time or possibly even the third time. Make sure to check out the first trailer for Ready Player One below.